Yunfu is internationally well-known as б░Stone Kingdomб▒, б░National Base & Center of Stone Materialsб▒, б░National Model Base of Stone Materials Circulationб▒, б░National Capital of Man-Made Stonesб▒б▒National Town for Folk Culture and Arts (Stone Carving)б▒ with more than 4,000 stone enterprises, and over 200,000 employees. Its world's best-selling stone products cover 70 countries and regions, of which annual total industrial output value reach tens of billions of dollars. In recent years, Yunfu vigorously promote the transformation and upgrading of the stone industry, and stone market trading volume is rising, so does to the international influence. After 13 sessions of meticulously organizing, China (Yunfu) International Stone Materials Sci & Tech Fair The 8th China(Yunfu) Stone Cultural Festival rely on its own advantages of stone industry base, international stone demands, geographical location and the port, whose exhibition scale has expanded to nearly 100,000 square meters from 30,000 square meters with the trade turnover climbing from 150 million to 3.50 billion yuan. Huge economic benefits have been brought to the domestic and foreign enterprises, and the field of stone import and export trade, stone market, real estate, construction and decoration design industry because of its degree of internationalization and brand influence. To pull together in times of trouble, people paddle a boat! 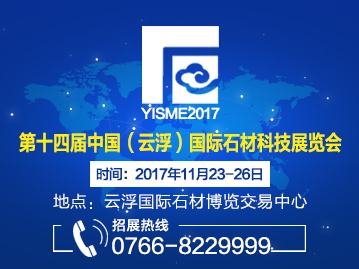 From November 23rd to 26th , 2017, we sincerely invite you to attend The 14th China(Yunfu) International Stone Materials Sci & Tech Fair The 8th China(Yunfu) Stone Cultural Festival, to enjoy a harvest feast with exquisite stone products, distinctive features, and performing wonders under the joint efforts! In 2016, the exhibition area reached 92,300 square meters with more than 80,000 visitors. Continuously improving the number of special equipment exhibition area in 2016, the Fair of 2017 is to be held in Yunfu International Stone Expo&Trading Center, which will further increase its scale, fully to meet the needs of home and abroad exhibitors. At present, from Italy, Turkey, Iran and other famous stone producers, purchasing groups and the domestic Fujian, Shanghai, Shandong, Guangdong and Yunfu local stone enterprises, machinery enterprises make it clear to be exhibitors. Then approximately 500 exhibitors will show the most advanced global equipment and technology of stone collection as well as stone processing with gathering different kinds of slabs, shaped stone and handicrafts. Thanks to the upstream and downstream relationships established over years in the real estate industry, the Fair is to invite all the traders, contractors, construction decoration companies and government infrastructure units to visit and negotiate on the fair. At the same time, site visits to Yunfu stone industry cluster of more than 4,000 stone enterprises for business talks are warmly welcomed. Making full use of exhibition industry database resources , for advertising promotion and special reports home and abroad via 40 domestic industry publications, professional websites and mass media authority as well as the SMS, outdoor, DM leaflet, e-mail and other ways, to achieve uninterrupted publicity, all dimension advertisement from top to toe. As a result that the attendance are mass, high accurate, without loopholes and ensure the professional audience overtake the last. Yunfu Stone Expo Industrial Co., Ltd.
Yunfu WanShengDa Exhibition Service Co., Ltd.
From October 18th to 21st , 2016, The 13rd China (Yunfu) International Stone Materials Sci& Tech Fair and The 7th China (Yunfu) Stone Cultural Festival held in Yuncheng Stone International Industry Park of Yunfu,China, lasting for 4 days, the exhibition area of 92,300 square meters, participating merchants came from Italy, Mexico, Afghanistan, Turkey and other 10 countries and regions. The total trade volume of the stone exhibition reached to RMB 5,39 billion of which the total volume of trade transactions reached to RMB 3,707 billion, including 25 investment projects, the total planned investment amounted to RMB 1.683 billon. The 14th China(Yunfu) International Stone Materials Sci & Tech Fair and The 8th China(Yunfu) Stone Cultural Festival will be held from November 23rd to 26th, 2017 in the Yunfu International Stone Materials Expo & Trading Center. The exhibition area of over 100,000 square meters, visitors will exceed the number of 100,000. Stone blocks from both of home and abroad, natural & man-made stone products, slabs as well as stone processing equipment and accessories, etc. will be exhibited. Here we bring stone as the media, with culture as the soul, to strengthen both hard and soft supporting construction of the Fair, and strive to make it the biggest domestic, international first-class professional stone exhibition. We sincerely invite stone and related companies to attend the Fair, and have business talks to create more business opportunities by cooperation! Stone protection products, adhesives, diamond saw blade, abrasive and other auxiliary materials; professional stone material, design and construction technology, scientific research, industry websites and media.